It’s the Wild Wild West in Idaho for leasing office or industrial space, so HOWDY PARTNER and you are on your own, BUCKAROO! Office and industrial leases come with obligations of 3, 5 or 10 years and have huge financial ramifications. That they’re not regulated by the state real estate commission is amazing. With this lack of oversight, it’s up to you to do your research on who will best represent you in your commercial real estate lease. We at Tenant Realty Advisors are licensed real estate brokers. We’re also independent, unbiased advisors to our clients who are the tenants – never the landlords. Among other things, it’s about figuring out whose side an agent is on in this license-free territory. When you buy a home, Idaho Real Estate regulations require that not long after the first contact the agent explain and disclose that he or she will be treating you as either a client or a customer. Also explained are the duties of loyalty owed to each party – or in the case of so-called “dual agency,” the lack of required loyalty, as the agent is working both sides of the sale. But when it comes to leasing space for your business, there is no similar requirement. Your broker has no clear obligations when he or she takes you on as a client. Their duty of loyalty is not spelled out. So it falls to you to ask the question: Can an agent whose company has “For Lease and “For Sale” signs all over the Treasure Valley truly push back against any landlords to advance your economic interests? How can he or she champion the landlord’s best interests one day and then be your hero the next? I would find it just about impossible. Remember if that agent’s company has “For Lease” or “For Sale” signs on the property you’re pursuing but says he or she is “helping” you – that situation has to be a defined as a dual agency and, really, no one is advocating for you. At least with a residential agent, if you are on your own you know it. Not so in commercial leasing. Yes, for sure, most real estate agents are friendly, outgoing, nice people – they are hard-wired to either be helpful or sound helpful. As a result, it’s very easy for the inexperienced tenant to think that nice, friendly, helpful agent whose company has “For Lease” signs on buildings all over Boise is on his or her side. Easy mistake – people make it all day, every day. The entire commercial real estate environment can be murky at best and abounds with opportunities for misunderstandings, for undisclosed agendas and for tenants wondering if they asked all the right questions, etc. The best way to avoid conflicts of interest is to NOT put an agent whose firm often represents landlords in the position to potentially be on both sides. If that situation doesn’t make an agent feel uncomfortable, it should. 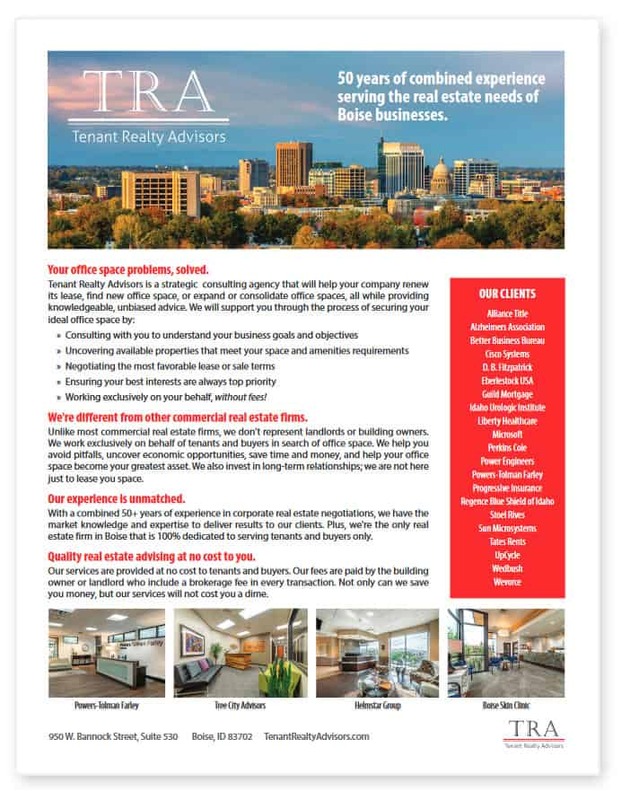 Seek out an independent, unbiased agent who follows the tenant-centric business model of Tenant Realty Advisors. Your agenda will be his or her only agenda. And if you need another reason, know this: Our services don’t cost the tenant extra. More on that in the next newsletter. In the meantime, don’t jump into the Wild Wild West of commercial leasing without lassoing yourself a guide whose loyalties are clear! I enjoyed the Wild Wild West article. It would be nice to have that information disseminated to a larger audience than whomever receives your email.